I am going to feature two spreads for this post as I used a technique that involves both spreads. But first, the background to the event. 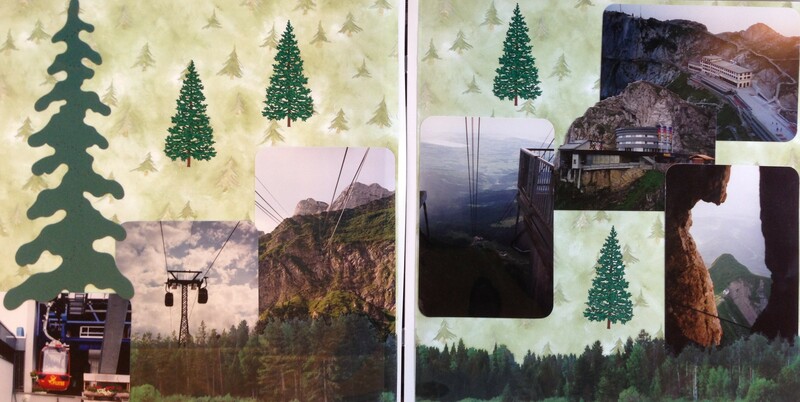 We had opportunity to white water raft in Austria and the in the first picture, the left hand page is a picture that was taken of us on that trip. Unfortunately I did not do any journaling and I can’t remember then name of the river, just that I had a blast doing it. The lesson to be learned is to always journal the important details so that you can remember them later. Victoria stayed in this hotel. The second one, which looks more modern, was built later and was completely round – we ate supper and breakfast the next morning in this building. If you look carefully in the bottom picture you can see a tiny chapel that was built way up in the mountains. Notice that the picture of the modern hotel has been cut along the outline of the mountain. This was done so that all the pictures could fit together without overlapping important parts, and I really like the way this turned out. I did this very carefully with a precision pair of scissors so that the cuts would be perfect. Be careful when considering doing this as you could end up ruining the photograph. This blog contains affiliate links and I will be compensated if you make a purchase after clicking on external links.